Here is my first short blurb about my thoughts on this computer, the Lenovo M90z. I'm testing this computer, thanks to Lenovo. 1) Sometimes I am holding my one year old on my lap while I'm trying to work on the computer. I may do some charting at home. I may read medical articles. 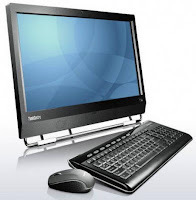 With the Lenovo, I have the option to unhook the keyboard and just use the touchscreen. This is useful because when I am holding my daughter using my laptop, she will usually bang on the keyboard and mess up my typing or accidently send emails to people without a body. So with a touchscreen computer, it is easier for me to keep it out of her reach. 2) The big wide screen of the Lenovo (23 inches) is much bigger than my laptop so my three year old finds that watching movies or cartoons on it pretty enjoyable. 3) The other advantage of the big screen is that you can easily fit two windows in the screen to multitask. Plus the machine is very fast.. so this is helpful when I need to try to get as many things done as possible while the kids are napping.